More than half of the 11 year olds who passed tests in English last year could not spell the words "effortless" and "participate", a report suggests. Some 75% of the two million children who took spelling, reading and writing tests reached the required standard. Of these, just 12% spelt "thoroughly" correctly, while "rehearsed" was beyond 67.5%, the Qualifications and Curriculum Authority found. The QCA analysed a sample of 215 successful candidates' test papers. It found more than 80% had spelled words such as "together", "important" and "involved" correctly. But "qualified" proved too hard for four out of 10 pupils. Only 43% spelled "effortless" correctly, while just 40% had "knowledge" right, with the silent "k" and the "dg" catching out many pupils. The analysis showed 61% spelled "participate" wrongly, with the "c" causing problems. Nick Seaton, chairman of the Campaign for Real Education, said: "I think that parents and employers will be absolutely horrified that more than half of 11 year olds haven't learned to spell a fairly regular word like 'effortless'. "I would have thought that these are the very things that primary schools should be doing, although they say they are concentrating on the basics." 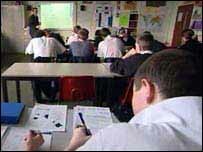 The government had set a target that by 2002 80% of 11 year olds should have reached "Level 4", regarded as a pass mark. However, the proportion that did so in 2003 remained at 75%, not having changed since 2000. David Hart, general secretary of the National Association of Head Teachers, said: "I think that, rather than concentrating on whether schools are actually slavishly following the literacy strategy, we want to make sure that teachers are doing what they were traditionally doing before the literacy strategy was ever invented - namely, making sure their children can spell properly before they leave primary school. "If children can't spell those words, despite the fact they are achieving the level expected at age 11, then something needs to be done in the way of urgent awareness-raising and training." A Department for Education and Skills spokesman said: "There is no doubt that standards have risen in primary school, although we clearly have more work to do." A QCA spokesman said: "We continue to work with teachers to develop ways in which the outcomes from the tests can be used to improve pupil performance."